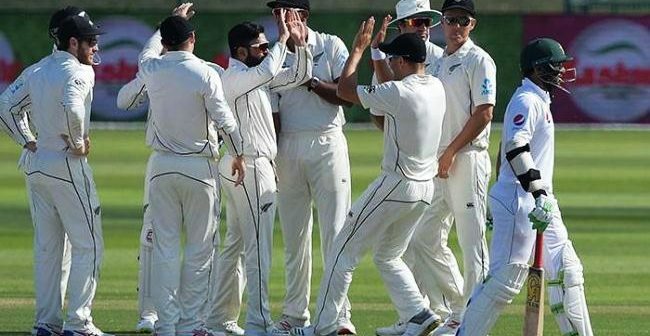 New Zealand players celebrating their victory on Monday in first test against Pakistan. 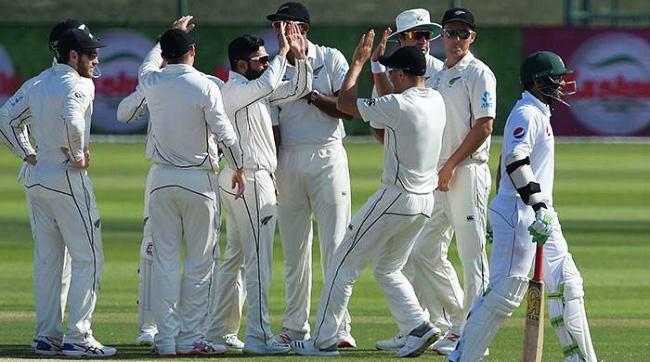 ABU DHABI/ ISLAMABAD (ENN) Pakistan fell short by four runs as New Zealand won the nail-biting first Test in Abu Dhabi on Monday. Pakistan were just four runs away from victory when their last settled batsman, Azhar Ali, failed to take the team to the other side and fell lbw. 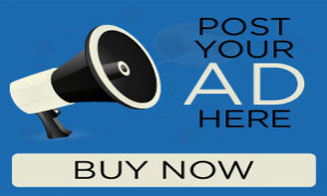 Kevis Ajaz Patel blasted the batting of Pakistan by taking five wickets. Set 176 to chase, Pakistan required only 139 runs to win with 10 wickets remaining when they resumed batting today. The match, however, was spun around by New Zealand’s Aijaz Patel, who took a five-for to cap a brilliant debut performance and win Man of the Match award.